The Godfather of Meatballs? 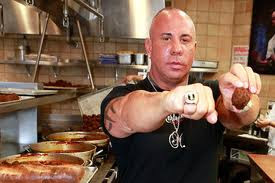 Yes, as of This moment, I Daniel Bellino-Zwicke claim the great Steve Martorano "The Godfather of Meatballs." "yo Cuz!" Steve Martorano comes from South Philly, brought up in an environment of Wise Guy Mobsters not unlike those portrayed in The Sopranos and Goodfellas, including the great James Gandolfini (recently passed Summer 2013 R.I.P.) . Steve Martorano grew up right in the thick of it with uncle Raymond "Long John" Martorano a Philadelphia Mob Big Shot, and father a Loan Shark. Steve looked up to these men, and says at one time aspired to be like them. A legion of fans, me included are happy he didn't, but ended up opening a World Famous Restaurant "Cafe Martornao" in Fort Lauderdale, Florida. Steve and his Meatballs would become even more famous once Gourmet Magazine claimed his Meatballs The World's Best. Yes Steve took another path. he loved music and excitement and became a DJ in and around Philadelphia in the 1970's .. You may not know it, but your not going to get rich spinning records in night-clubs, so to supplement his income, he started making Meatballs and Sandwiches in his apartment. The Meatballs and Sandwiches of course quite tasty, but Steve still wasn't going to get rich doing that. But selling the sandwiches from his apartment or mothers basement started something. Steve liked doing it, and as any good cook knows, it gives you great pleasure to cook for others, especially when they dig what you're doing. Cafe Martorano was born and the rest is history. Cafe Martorano has seen its share of Celeebrities over the years, the first being fellow Italian-American Tony Bennett (Benedetto), followed by Dan Marino (Italian as well), Joe Montana and a slew of others. Steve and his Cafe Martorano have done well, legions of fans bear that out, he's the Pope of Fort Launderdale, The Prince of South Philly, and now The Godfather of Meatballs." Labels: Cafe Martorano, Mortarano The Godfather of Meatballs, South POhilly Italian, Spagehtti and Meatballs, Steve Martorano Meatballs, Worlds Best Meatballs.